Lorna Jackie Wilson was born on April 11, 1964, in Detroit, Michigan to Carrie Jean Wilson. Lorna has lived in Michigan most of her life, outside of U.S. Army military enlistment. At the age of four, Lorna was placed in foster care. At the age of 10, she was reunited with her mother and siblings, only to be separated and returned to foster care at the age of 13. Lorna’s journey and related circumstances surrounding foster care placement presented situational experiences that no one should ever have to face. Feeling lost and abandoned, Lorna began to write. Initially, the harsh realities of life spilled into her journals. However, the journals became a testimony to others, illustrating the life of an overcomer. In Lorna’s last and final foster care home, she was placed with Acie Lee Spraddling. Acie Lee Spraddling was the catalyst toward positive change. She was a true advocate for youth, adopting 11 children and taking in 17 foster care children. As a parent, Acie led by example and truly cared for children. She introduced Lorna to Christ and took her to church at nearly every opportunity. Needless to say, Lorna’s journals began to embody faith and hope. Acie made her heavenly transition on July 21, 2015. Her legacy lives on through her children. Lorna’s journey continues as she gives back by speaking to youth about foster care experiences and overcoming obstacles. She has four beautiful children that support her writing and encourage its continuance. She holds master's degrees in teaching & technology. Black Butterfly: The Journey - The Victory by Lorna Jackie Wilson is a book of the author's poetry, compiled into a collection of poems. Separated into two sections, the poetry compilation and tributes, Wilson shares her experiences as a child in the foster care system, personal tragedy, a life shaped by her love of Christ and as a resilient, intelligent, and potent black woman, and the trials and tribulations of being a survivor. Within each verse Wilson lays bare her spirit - both broken and made whole - in a heartfelt book that will bring solace and inspiration to all those who can relate to the strength of her words, and evoke empathy and revelation in everyone else. As a foster carer myself, I was intrigued by the opportunity to read the work of someone who had been in the system and ultimately returned, this time on her own terms, to care for those who have been placed into a system that often feels hopeless to both the children and their natural parents. There wasn't a single line within Black Butterfly: The Journey - The Victory by Lorna Jackie Wilson that didn't call to the deepest fissure of my heart. With poignant words and almost choral formation, Wilson has created a gem of a book of poetry that I wholeheartedly recommend to children, parents and foster carers, social workers, teachers, and all those who are looking for an illuminated sense of where they've come from, and where the path may ultimately lead. Do you realize that our lives are a reflection of God within us? The essence of our witness is how we act in situations that affect all of us. Author Lorna Jackie Wilson introduces over thirty poems in Black Butterfly: The Journey, The Victory that express God’s love through relationships, loss, struggles and character building. “May this compilation of poetry inspire those with similar struggles or challenges, and may the journey illustrate the life of an overcomer,” says Lorna. As you read Black Butterfly: The Journey, The Victory you will be able to see the beauty of words as poems give tribute to loved ones such as Belle Starr, Bishop Mariea Claxton, Hazel Winston Lowe and Maya Angelou. To bring the message home, Lorna has also dedicated poems to life events from black history, the military and the killings at Sandy Brooks Elementary to the 9/11 tragedy. As I read Black Butterfly: The Journey, The Victory by Lorna Jackie Wilson, I enjoy the eclectic nature of the poems; there is something here for everyone. As Lorna sprinkles photo images and biblical scripture throughout Black Butterfly along with these beautiful words, you will walk through the steps and pathway of Lorna’s life. “While the journey reveals a combination of pain and loss, it also reveals love, laughter and accomplishment,” says Lorna. These words are reflective of Lorna’s upbringing, particularly her life in and out of foster homes and living with a drug addicted mother. Despite it all, Lorna has been able to overcome it all due to the love of God. If you want to read poems that are truthful, uplifting and passionate, pick up a copy of Black Butterfly: The Journey, The Victory by Lorna Jackie Wilson. 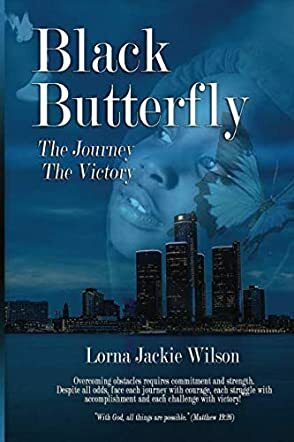 Black Butterfly: The Journey - The Victory by Lorna Jackie Wilson is a collection of poems that sets the tone for the riddles, struggles, and challenges that happen in life and how they can be handled with commitment and strength. The poems are thought provoking, haunting, and they also speak about the author’s faith in God. The poet’s tragedies and hardships form an integral part of her writings and the way she has gotten over them makes the collection uplifting and inspiring. The poems speak about myriad emotions that we experience, and also about life and what it teaches based on the experience that each one of us goes through in our lives. The poet lays bare her soul with these poems and she speaks about almost all topics that matter to everyone. She also speaks about the obstacles faced by a colored girl in society, along with her sadness, family relationships, and poverty through her writings. ‘I am Magnificent’ is one such poem in the collection where the poet celebrates her own self for what she is. The poet’s feelings of loss and abandonment are tangible to readers and I like the thought of having pictures before each poem as these capture the essence of the poems beautifully. Though the collection is about hope, courage, strength, and overcoming obstacles, love and faith are also woven into the poems. Lorna Jackie Wilson's emotions are raw, her pain is tangible, and her strength is palpable from the poems, and that makes this collection an engaging read. Black Butterfly: The Journey - The Victory by Lorna Jackie Wilson is a beautiful, inspiring collection of poetry which will tug at your heartstrings and give you an understanding of the struggles of a young colored girl in today's society. This is a book filled with hope and courage and shows, through the perfectly constructed prose, how you can succeed in this world if you have conviction and faith in the Lord. The topics are current and controversial. But the theme throughout is one girl's struggle to deal with the foster care system, domestic violence, family relationships, poverty and to come out on the other side strong and determined. This book of outstanding poetry conjured up every emotion from sadness to a determination to overcome my own issues. The haunting words of A Tragedy and A Tragedy In Connecticut really hit me to the core of my heart. The poems covered gritty and dark subjects, but they were written from the heart and with honesty. The theme I felt throughout was of courage and determination to succeed, no matter what the obstacles, because you have the Lord watching over you and He will only give you the challenges He knows you can overcome. Black Butterfly and Brown Brother again struck my heart. It was hard to choose a favorite poem, but if I had to then ‘How does one deal with loss’; that poem could have been written for the losses in my life. This book is amazing and I will read it again when I need inspiration to conquer anything. In life we all, at one point or another, deal with the ups and downs. When tragedy hits, it helps to know that there is hope for a brighter tomorrow. In her book titled Black Butterfly: The Journey - The Victory, Lorna Jackie Wilson put together a compelling collection of beautiful poems that touch on a number of topics including tragedy, loss, pain, empowerment, faith, healing, and so much more. Some battles we face together as a community while many are fought alone. Sometimes we find solace in each other while some healing journeys must be traveled solo. The poems in this book touch on all these circumstances and so much more. Some of the poems in Black Butterfly: The Journey - The Victory speak about tragic events known to many while others speak about those only known to the author, but they all have one thing in common. They capture the raw emotions of the situation and of life. The poems come together to tell a complete story of tragedy, sorrow, overcoming and healing. Each poem tells a story in words so simple yet so deep and, whether you have been through that particular circumstance or not, you will feel Lorna Jackie Wilson's emotions and you will relate to them. In addition, the images used capture the essence of every poem, bringing to life the emotions behind the words even more. The poems touch on a number of emotional topics and, in the end, they all deliver a strong message that even when all seems to be lost, there is always hope so hold on tight and never let go. Black Butterfly, is a good book of poetry. There were several poems that I found to be thought provoking. A troubled teen, strong black woman, Brown brother, and I am magnificent touched me. There were others that I liked, but those are still in my head. A woman empowered to win is on point, yes, I said on point. The poems seemed very personal. I wondered what the author had been through. “Black Butterfly” by Lorna Jackie Wilson is a collection of around sixty Christian faith-based poems that almost reads like a memoir. Wilson puts a lot of herself into this book. There are poems about family and tragedy as well as some about equality. Most of the poems have a rhyming cadence except for a few like, “Strong Black Woman”. This is a book dedicated to the praise of God and Jesus as well as to other Christian morals. I really resonated with “The Art of Giving” which celebrates those with generosity and encourages people to be giving. This is good advice no matter what religion you are. The use of rhyme to express ideals and memories in life is done expertly in this book. This isn’t really for people who aren’t that into Christianity though. There are still a lot of insights and interesting information in this collection of poems, and I do recommend that people read it. I read this book of poetry using Kindle Unlimited. Black Butterfly is a superb collection of poems. I only require two things of the poetry I read: elegant prose and rhyming. Check and check. These poems are deeply inspirational. Many will speak of dark subject matter like "A Tragedy.". Others are light hearted and whimsical, such as " Hopscotch." I loved "Game Changers Rule" for its drive. Many of the poems are spiritual. My favorite poem from the collection was "Before You Enter Heaven." "He's Captured Her Heart" spoke of lifelong romance. Clearly there is something for everyone in this collection. My hat is off to the poet. -- despite the tragedies in her childhood -- and shares her path of transcendence. As a social worker and a teacher, I have worked with many a foster child. While they were in my care, I always tried to nurture and support them. Some I knew for years; others were whisked away from foster care without a moment's notice, leaving me with nothing but a broken heart. I have always wondered what happened to them. Siblings play with paddle ball while another plays with jacks. Mother plays with sugar hill and fills her arm with smack. Empty cupboards sing a song for every child to hear. Grumbling are the hunger pangs standing in the mirror. Beautiful Compilation: I can remember attending a wedding when the maid of honor stood to speak. I knew the relationship between the MOH and the bride was a strong one, there was a lot of love there, a lot of support in tough times, a lot of mutual growth when those tough times separated them. It is difficult to generate a heartfelt speech that communicates that much caring, faith, and love. After receiving "Black Butterfly: The Journey - The Victory" through a giveaway, I wanted to be able to travel back in time to just before that wedding day and hand this book to the her. Many of the poems exude the feelings I know she wanted to express. Thank you so much! Many of you have captured the essence of my heart to express the thoughts that are often unspoken among foster care children or youth in crisis. Oftentimes, youth in crisis or foster care children suffer in silence, unable to articulate the depth of their experiences and how it may be interpreted by the world. Yet, your interpretations of Black Butterfly are truly the message of intent and I sincerely appreciate each and every one. It is my prayer that Black Butterfly will be used in classrooms or foster care agencies, especially in support of youth that find it difficult to express tumultuous journeys on their paths toward positive change!